This painting can be found in the Tomb of Nefertari in Luxor, Egypt. This work is a wall mural and is simply a small piece of a story that is depicted all throughout the temple walls. This story tells of Nefertari’s journey into the afterlife. 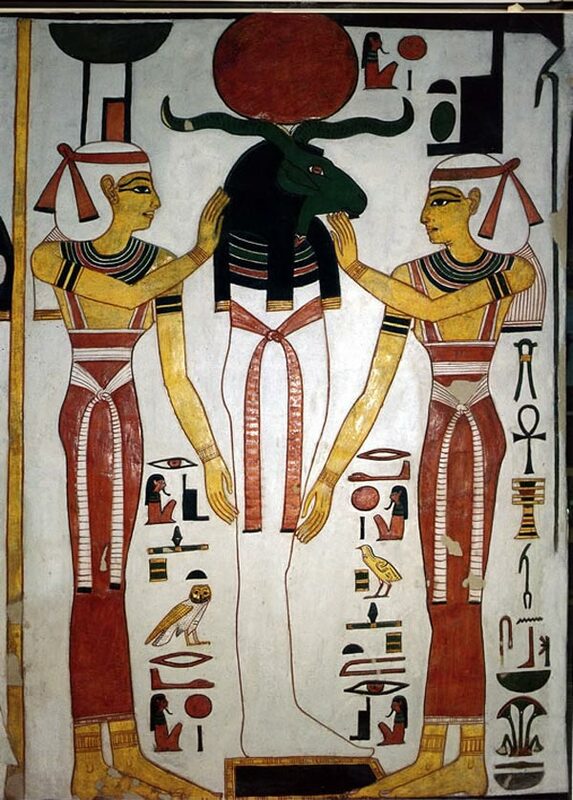 The painting features Khnum, the god of rebirth and creation, accompanied by the sisters Nephthys and Isis. Nephthys is said to be the goddess who represents death, while Isis represents rebirth. This painting was done in fresco technique, where the mural would have been painted on top of freshly laid plaster. The tomb of Nefertari was found in 1904 by Ernesto Schiapanelli. The tomb itself was said to have been made in 1255 BC after the death of Nefertari.